Wow. We knew that gender inequality in America was bad, but according to an alarming new study, it’s actually much worse than anyone could’ve thought. A recently released report from the U.S. Census Bureau revealed that female CEOs in America make a paltry 258 times what their average employee makes, while male CEOs make an average of 331 times more than theirs. That’s a pay gap of nearly 23 percent, which in dollar value—per median salary of U.S. CEOs—translates to an average disparity of $2.57 million, or enough to buy approximately 12 Aston Martins. These numbers empirically prove that inequality is alive and well in the United States. It’s hard to fathom that in 2015, women who take the same cutthroat routes to the peak of the corporate ladder as their male peers are still only earning the commensurate income of a combined 258 subordinates. This means these women are being forced to get by on just $8 million to $9 million a year (and that’s before taxes!). If true equality is ever to be achieved, then the wealth needs to funnel away from the pockets of the topmost male earners and into the offshore accounts of the women who are every bit as deserving. Why should male executives be able to afford five or six mountain estates across the world while their female counterparts are forced to make do with just four? 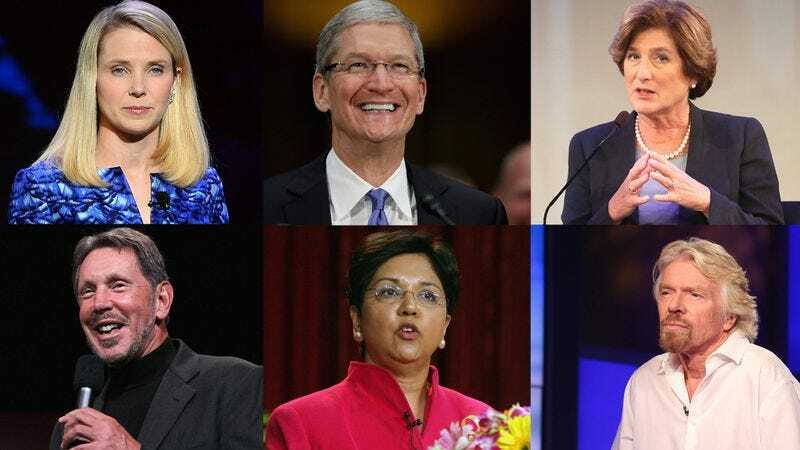 Share this article if you believe that gender discrimination is out of control and that female CEOs should be able to afford the same number of private jets and luxury yachts as male CEOs. It’s just what’s right.